Book Review : An Idiot, Placements and IntervYOU. 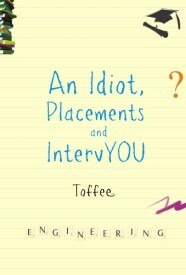 An Idiot, Placements and IntervYOU by Toffee (Taufeeq Ahmed) takes one through the experiences of the author during the ‘placement season’ of his college life.The author walks through the entire process, right from the preparation for the Aptitude tests to the various levels of selection, depending on the recruiting organization. He gives an in-depth analysis at each stage, describes every intrinsic process that normally takes place and guides us on how we should tackle the various difficulties that might crop up. For a person who has been there, done that and procured a job, this book would just be telling things that already they know. But for a person who is just about to take that first step towards bagging their dream job, this book would help them in more than one way. Those who were placed through ‘Campus Recruitment would probably be able to relate to what I say in a better way. From Day 1 of college, one thing that would be stressed at every juncture is this : Campus Recruitment. I remember how I had no idea what, when and how I should be preparing for it. The mere mention of the words ‘Paper presentation’, ‘Certification’, ’Aptitude’, ’Group Discussion’ and ‘Interview’ used to send shivers down the spine at the time when we had completely no idea as to what it was and how to get it done. Though many sources of information were made available, there would always be that nagging question of what ifs and what not’s which were never expressed, let alone getting clarified. We would find ourselves asking so many questions and waiting miraculously for someone to understand what we were trying to ask and explain accordingly. For a person in that situation, this book would give all the answers to all their questions however trivial or silly it might seem. The author takes one thing at a time and explains in detail all that is required for a student. For instance in the chapter that deals with Interview, he goes on to give his insight on how the interviews should be tackled at the basic level, what preparations are required from our side, what to talk, what not to talk, how to be dressed, how to appear calm and composed and not fret about, showing our nervousness. This is just an example. In a similar way he deals with the other important aspects too. Over all, neatly written. How you enjoy the book would depend on which side of the ladder you find yourself in. I think we can read it, sounds a bit different. If you're free pls do take it up 🙂 Have a nice day!! Hello Ash 😀 Pick your gift here!!! @Toffee: Ops , dint knew the author of the book would read this 😉 ..
Hi, Welcome to my Blog 🙂 Thanks for your wonderful words. Today, where western countries are giving chance to girls equivalent to the boys, in our country, people still kill girl child. There are some Top Engineering Colleges in Rajasthan which approaches girls to brighten their future.